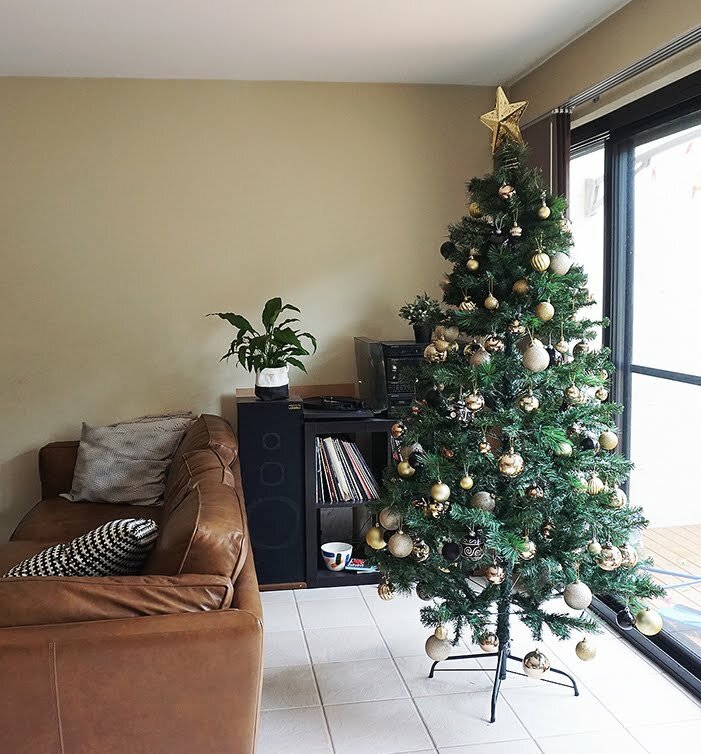 This year is my first Christmas living out of home and I was so excited to finally get a chance to buy and decorate my very own tree with Josh. We're hoping to start a few cute Christmas conditions that we can stick to every year. For starters, decorating the tree together. I picked out our tree from Big W. The Soho Christmas Tree. 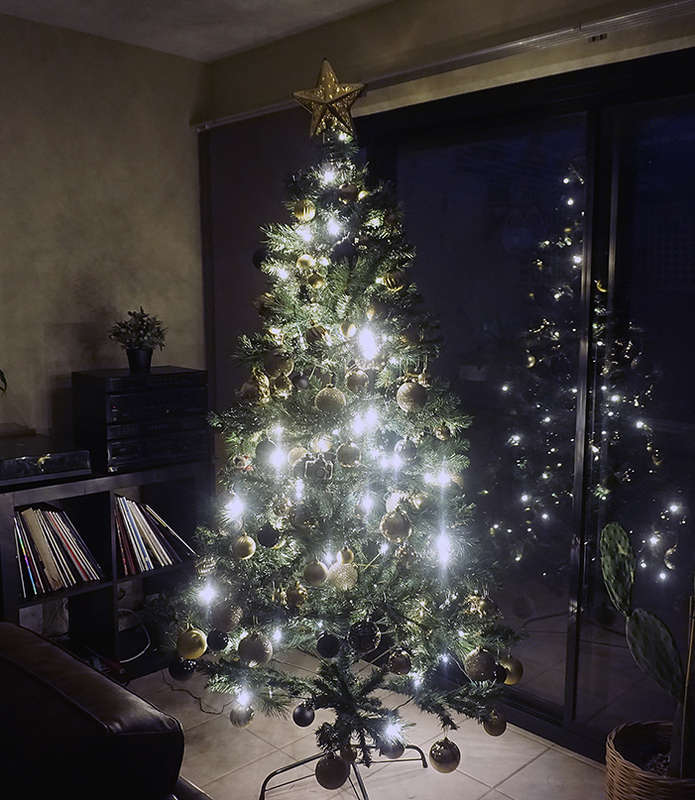 195cm tall, realistic looking pine leaves scattered throughout, and pretty golden lights already threaded through the tree, so no need to add our own Christmas lights. I decorated the tree with three packs of baubles also from Big W. At about $10 a pack it was pretty affordable, especially for our first tree. One pack was just filled with gold baubles of all different sizes, while the other two, my personal favourite, had black, copper, rose gold, gold and silver baubles. 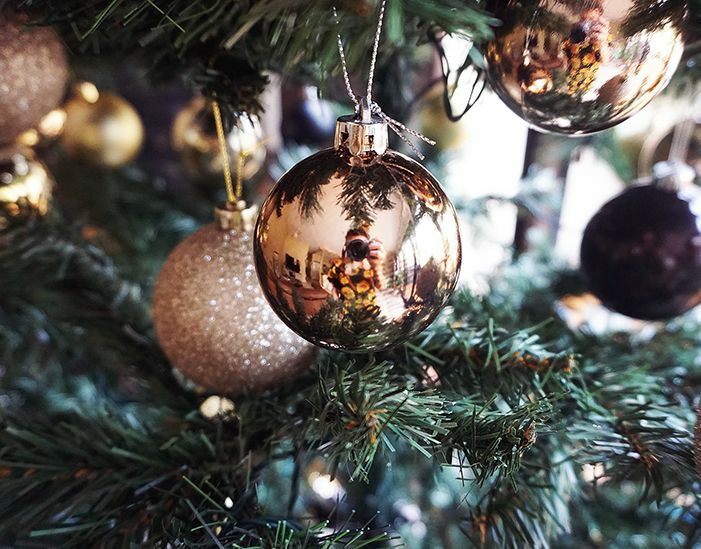 It was so good to find a pack of baubles for so cheap, because it was the only copper ones that we came across the entire time we were searching. That weren't sold individually that is. My Cute little skiing Christmas penguin! Josh suggested it would be cute if we had a nice little ornament of our own choosing that represented ourselves. A special bauble that would be a bit of a tradition. We looked through all the beautiful glass and ceramic ornaments at David Jones and I finally picked a cute little Christmas penguin. Whose ski's are candy canes. Delightful. Josh's is a tad less Christmassy, but a bit more representative of himself than mine is. He's a lover of photography, and studies journalism, so it's a good fit! I'm really delighted with how the tree turned out! Josh even set it up on a timer so that the tree turns on and off by itself every night. It gives the living room a magical glow and really gets me into the Christmas spirit! 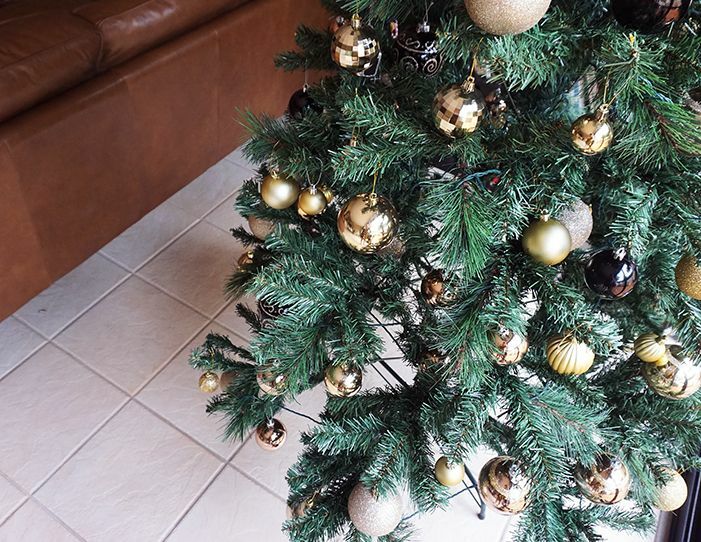 I would love to see how you have decorated your tree, or any nice traditions you have at Christmas! So please share them in the comments, or link me to any blog posts you've made about it! I hope everyone is having a good holiday season so far! 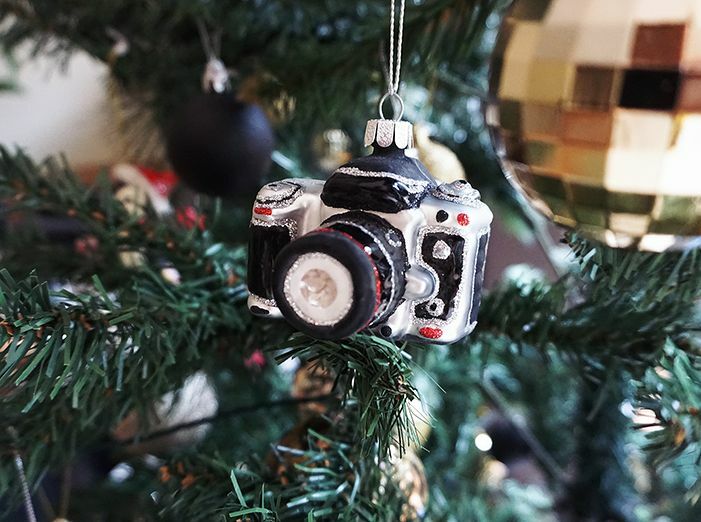 I love the penguin and camera baubles, so cute! Such a cute tree! Love the little penguin and camera. This is so cute! I love how your tree turned out. I cannot wait to move out of home and decorate my own tree! You have inspired me to do a similar kind of post though! This was so wonderful, I love the penguin! SO GORGEOUS! I haven't even bothered to set up a Christmas tree since I will be away for Christmas (I know, I know, so slack!). Next year I'm going to aim for something really similar to this, it's gorgeous and so classic! This is so sweet! Enjoy your first Christmas in your own place hun. Lovely post! Your christmas tree is lovely , merry christmas! 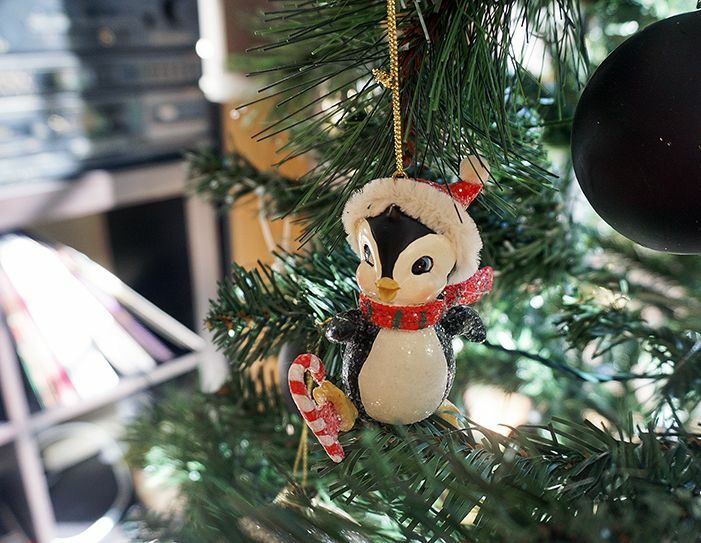 I love your little camera and penguin ornaments too! Oh my gosh. The tree is so beautiful and I love the reflection in the glass. So magical!